Two of our top keyboards of 2018 are on sale now. 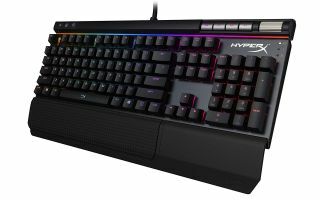 A few of our best gaming keyboards are available on Amazon for a lot less than normal: you can get the HyperX Alloy Elite for $119.99 or the Corsair K95 RGB Platinum for just $139.99. In the case of the Platinum this saves you 30%, making it the cheapest it’s ever been on Amazon. But which one should you go for? If you’re after an affordable yet high-quality setup, the HyperX Alloy Elite would be our recommendation. In fact, it was our best gaming keyboard of 2018. That’s because it “leaves no box unchecked in features. It’s equipped with dedicated media controls, USB passthrough, a detachable wristrest, and backlighting”. The board also supports “full N-key rollover, meaning you never have to worry about key presses not registering”. Meanwhile, those who are happy to spend a little more should consider the K95 RGB Platinum. Thanks to superb build quality and a ton of features, this is arguably the best high-end keyboard money can buy. Despite being on the large side, it’s worth investing in if you’ve got the space for it on your gaming setup. For a cheaper Corsair alternative, check out the K68 RGB. This is on sale as well for the slightly more affordable $69.99. Because it’s got IP32 dust and water resistance, the K68 will take almost any spill or accident you can throw at it.